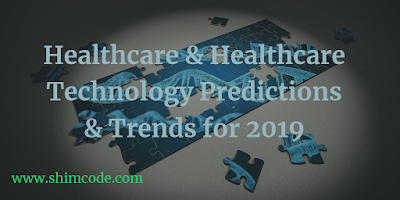 It’s prediction season and all of the experts, thought leaders, consultants and others operating in and around the edges of the healthcare industry are sharing their lists of predictions and trends expected to take place in 2019 and beyond. For the fourth year in a row – I’m sharing a list of lists I believe are fit for sharing. That means lists that are not ALL overly broad and that are detailed enough to provide some level of value to you the reader. 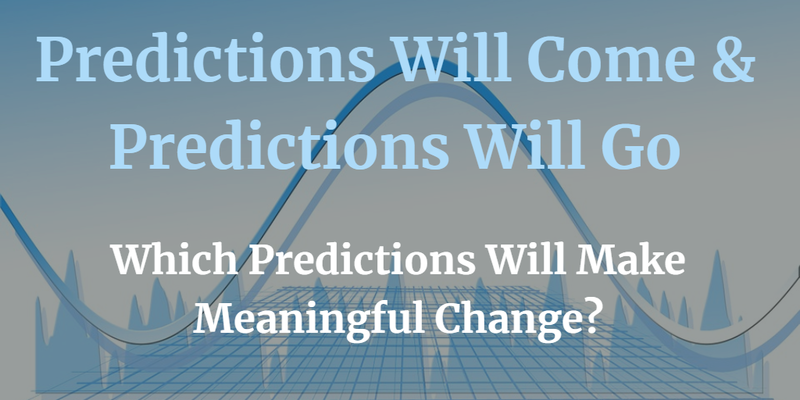 The following three lists of healthcare predictions and trends have been among my most popular blog posts over the last three years. 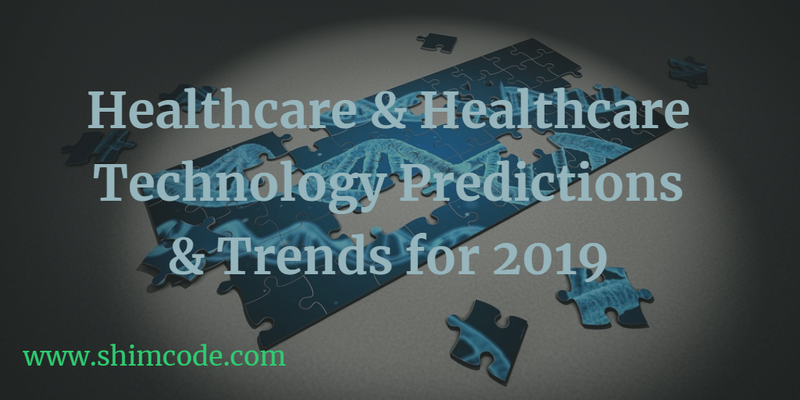 One prediction you can be sure to come true is that more ‘Top Healthcare Predictions & Trends’ lists will be released over the next few weeks as 2018 winds down. As in previous posts, I’ll update this post with new information as I find them. 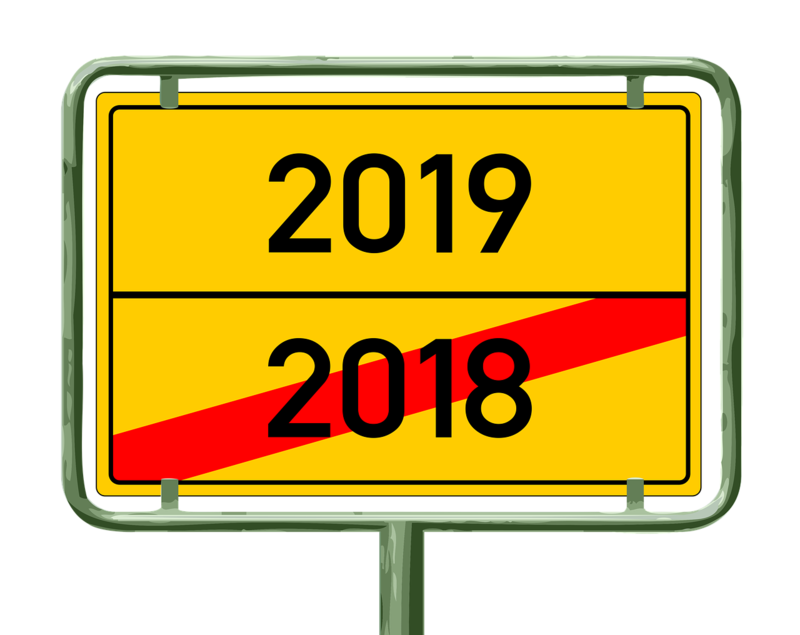 So bookmark this page – or better yet – subscribe to this blog and/or follow me on Twitter so you’re easily kept in the loop on what to expect in 2019 and beyond. 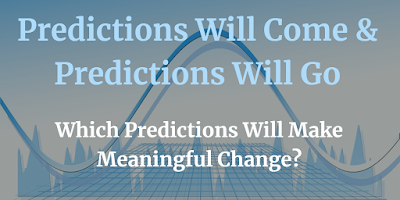 If you have any of your own predictions or know of lists that I can add to this post, please share them in the comments or send them to me at info@shimcode.com. I'll add them and attribute them to you - if you want me to do so. 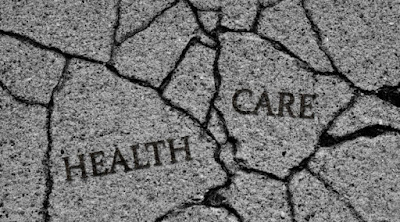 Anyone who’s read this blog and/or seen my shares in social media channels know that social determinants of health and Medicare are two topics near and dear to me. I’ve spent a lot of my time and effort over the last 4-5 years researching, creating, curating and sharing information about how non-medical conditions impact our health and quality of life. See the end of this post for additional information on this claim. Last month, I had the privilege of interviewing Dr. Michael Cantor MD – Chief Medical Officer of CareCentrix - at the 2018 Annual Forum of the HealthCare Executive Group (HCEG). The interview was live-streamed by CareCentrix via Twitter’s Periscope tool and has so far been viewed over 28k+ times. This blog post is a transcript of my interview with Dr. Cantor as he shared his thoughts on HCEG’s Annual Forum, the importance of addressing social determinants of health, using artificial intelligence and machine language to scale post-acute and chronic care services, and his thoughts about how supplemental non-medical services authorized under the Chronic Care Act can help to improve outcomes for Medicare Advantage beneficiaries. Hello everyone. 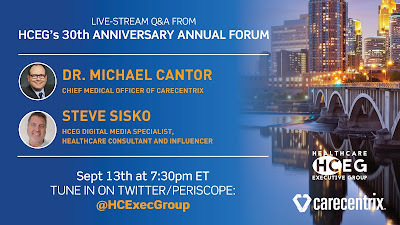 I'm Steve Sisko with the HealthCare Executive Group here in Minneapolis at the Healthcare Executive Group’s 2018 Annual Forum - celebrating its 30th year anniversary. I'm with Dr. Michael Cantor, the Chief Medical Officer of CareCentrix and like to talk with Dr. Cantor tonight about a few of the things that have happened over the last couple days and get his perspective on some of his observations. Good evening, Dr. Cantor. Mike. Alright, great to be here. So, it's been an interesting couple day here at the conference. And what in the in the last couple days has stood out to you in terms of, you know, your background as a geriatrician and what you've observed in the conference related to your areas of interest? Well, first I want to say it's just been a great discussion. There have been really interesting people both who are presenting and also participating in the audience discussions. People from the payer-provider communities, vendors and also people from outside of healthcare. So, it's been interesting to have all those different perspectives and to have so many articulate discussions about the challenges and the opportunities for improvement. And what’s been the really interesting thing is the recognition - it's pretty universal - that our healthcare system is fundamentally broken and needs to change. Over the last day and a half, we spent a lot of time talking not just about whether or not it's broken, we all agree on that. But really the acceptance that the change will come and that there's hope and that by doing things like incorporating social determinants of health and overcoming the barriers to accessing them. By focusing on the Blue Zones where people can live longer by making healthy choices. By making sure that we are making the investments that are not only needed to provide returns to the investors but also guided by social criteria to make sure that those investments are having a positive impact on communities. When you put that all together it really speaks to the fact that we recognize that there's a need for change. But there's momentum and that change is coming. 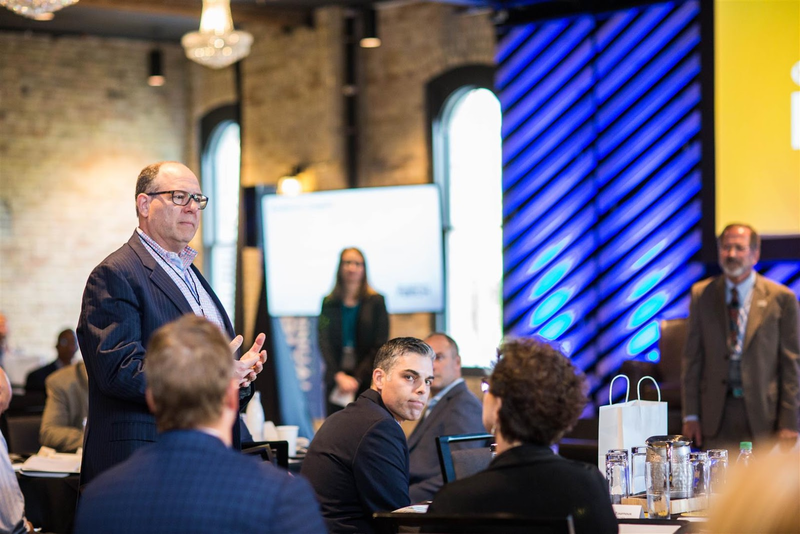 The Health Care Executive Group, its annual forum and its regional events have drawn a wide variety of people: payers, health plan providers, and various vendors of different types. Was there anything that you expected to see, that you didn't see or didn't hear over the last couple of days? I think there's just recognition that we have to wait and see what happens with midterm elections. And it just doesn't make sense to speculate until the outcome of those elections is clear. The other thing that I didn't hear as much about is post-acute care. Normally we hear a lot about opportunities to reduce waste. That's what we focus on at CareCentrix. You know reducing days in nursing homes, reducing nursing home use, reducing readmissions. Really wasn't much discussion about that at all in the last day and a half. Yeah. 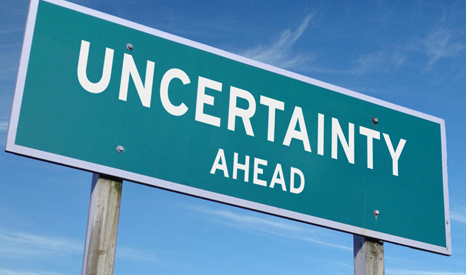 And the uncertainty in health care was a topic that Andy Slavitt, one of the speakers yesterday, brought up. And you know as a geriatrician, you spend a lot of time with the aging and that cohort. Dan Buettner, who was also a keynote speaker brought up the idea of improving healthy aging in individuals and communities. As a geriatrician, what did you take away from Dan's speech and share today that could be applied to individuals or communities? The biggest takeaway for me is that if we can change the living environment, change the community, they'll have much more of an impact to be much more effective than just targeting individual behavior change, or coaching people to change their diet or exercise more. If you can make the healthy choice, the only choice, not just the easy choice but the only choice, that's way more effective in trying to people that they should do things differently and change. For example, if you go out to eat, and Dan talked about this, the average restaurant meal is usually about 300 calories more than what you would eat at home. So, either you don't go out to eat, which for Americans probably isn't going to happen, or you change what happens when people go out to eat. You reduce the number of fast-food restaurants, you work with the restaurants in the community to offer half-size entree portions. You make it so that even the [menu item] names talk to you. He mentioned the idea of “tasty” or “crispy”. And they didn't change the recipe at all. But sales went up. The bottom line is that there are five things that he's described that really make a difference for individuals. 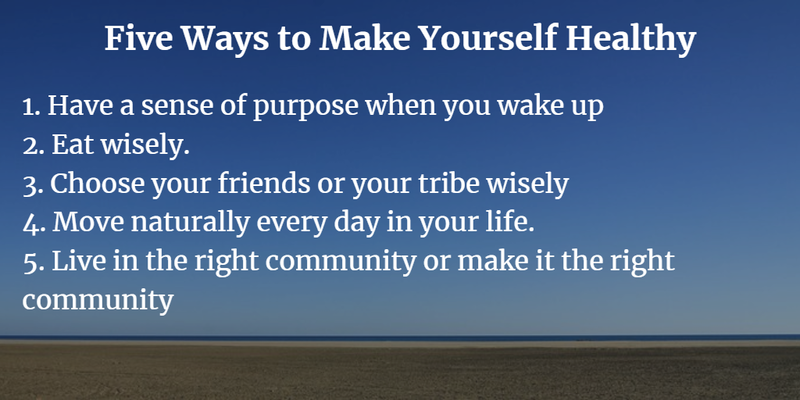 Having a sense of purpose when you wake up in the morning. Do you know why you're doing something? You have something to look forward to. Eat wisely, so don't be stupid about how much you eat. 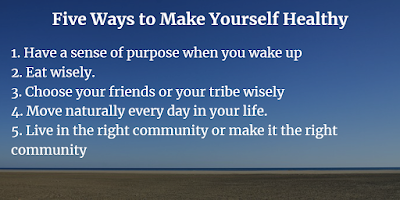 Choose your friends or your tribe wisely, because it turns out that your friend’s health behaviors influence your health behaviors. So, if you hang out with people who eat too much, exercise too little, complain a lot, don't like to hang out with other people, your health could be adversely affected by that. Move naturally, which means not just doing long bike rides or marathons. But every day in your life, can you park a little further away, and walk a few more steps? Can you take the stairs instead of taking the elevator? Those small changes add up. And finally, live in the right community, or make it the right community, by doing the things that he and his team are actually doing around the country. Here in the U.S, they're putting in pedestrian lanes. They're putting in bike lanes. They're making it easier for people to walk downtown, instead of having to take their cars or mass transportation. It's really restructuring the community. Everything, including smoking cessation and bans of smoking public places, all of those things add up. 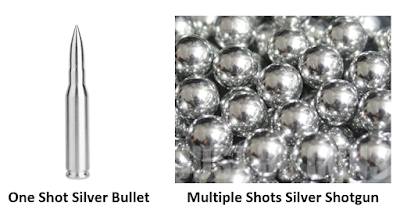 It's not one magic bullet, but lots of little changes to really make a huge difference for the life expectancy, and I would argue, the quality of life, for the people who are living in that community. 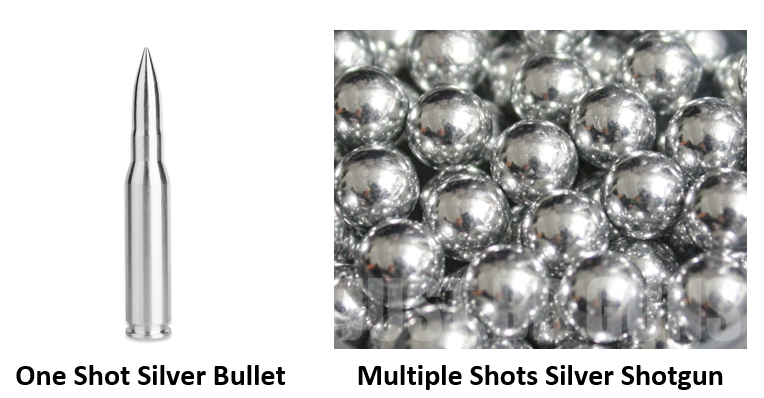 AI & Machine Learning Are Not Magic Bullets! You know, it was interesting, because Dan talked about how they analyzed which communities they would go into and what they could do. And I didn't hear anything about artificial intelligence or machine language from Dan. But I heard a lot about artificial intelligence and machine language from all the other speakers. So, what's your perspective, or take, on the idea of the use of artificial intelligence and machine language? In terms of improving opportunities for patients and also providers, and the payers? 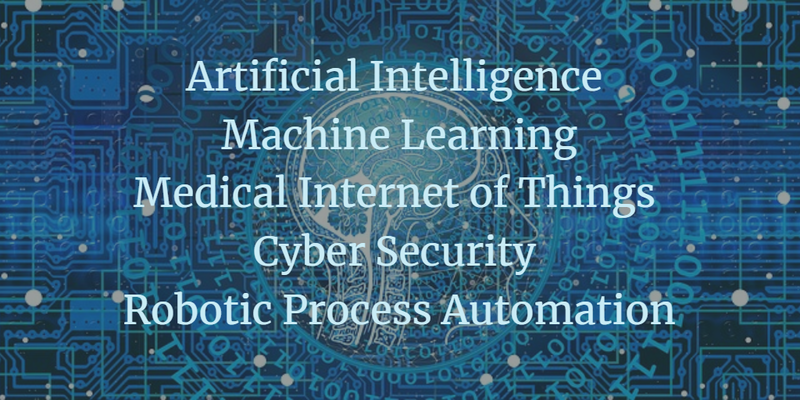 So artificial intelligence, which really is using machines to figure out, “How do we improve processes? How do we identify the right patients to target? How do we, in other words, use the computers to do the thinking for us, and enable us to have tools which will make us more efficient? That actually has a lot of potential in healthcare. 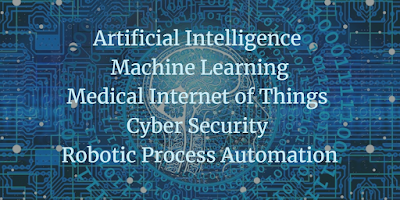 At CareCentrix we actually use artificial intelligence and machine learning today. So, for example, when we're thinking about discharging patients from the hospital and sending them home, we have a tool that tells us, “For a patient like this, there's 82 years old, has Parkinson's, was admitted due to a fall. So, the right path of care may be that they don't need a nursing home? They can go home with home health assistance. This is the right home health agency because they have good experience with Parkinson's. And we can lower readmission rates, and lower use of home health services for people who are just like that specific patient. 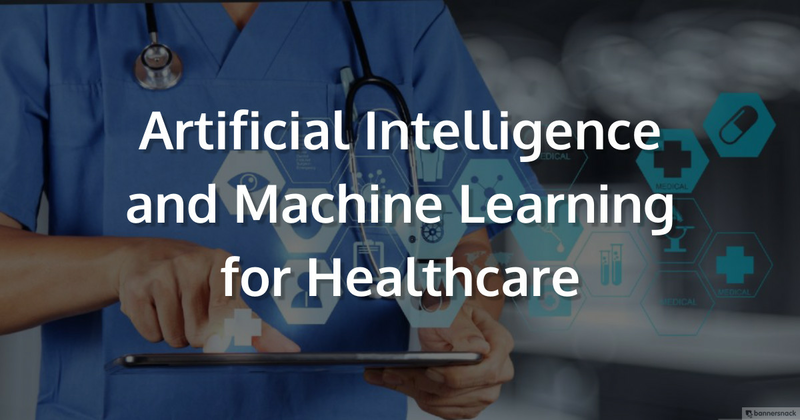 The only way to really figure out in a massive dataset with 10 million records, “What's the right path for that patient?” is to have machines with artificial intelligence to be able to do that, because neither you nor I could ever figure out how to do all that correlation. The other thing we do is in our call centers, we actually have natural language processing that's listening for certain keywords. If those keywords come up it generates a score and we have people standing by. Supervisors in real time waiting to get on that call, listening into the call, making it much more efficient and much more a much better experience for the caller who's getting frustrated because you don't have to wait for the person to go get their supervisor. Our supervisors, already, they're part of the conversation because the machine is letting that supervisor look at 50 different conversations at once. So, it's assisting them. It's taken on some of the grunt work and doing some of the background processing for them, particularly with the idea that you know all the discrete data. But then also the more nebulous data in terms of social determinants of health. You know, all of us patients, providers and payers, we all need that assistance. And social determinants of health is a big buzzword. I mean it's been that way for years now and getting a lot of attention. 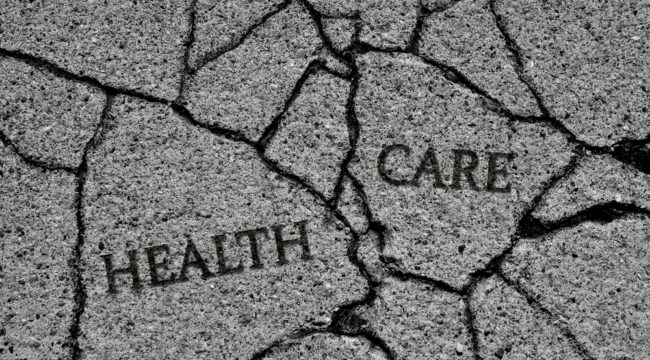 What's your impression or take on some of the topics regarding the social determinants of health that were discussed in the forum yesterday and today? 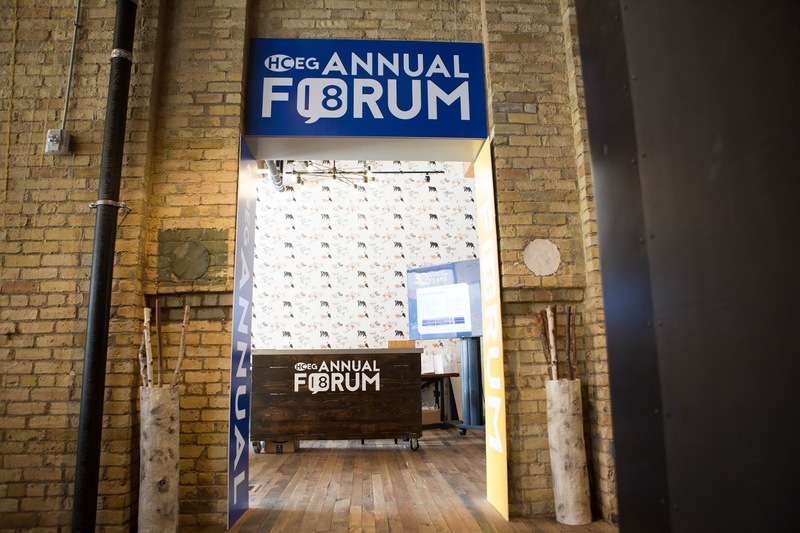 We really appreciate the opportunity to listen in on those [HCEG Annual Forum] panels because I learned a lot about what's happening, what's on the cutting edge in this area. The term 'social determinants of health' is not helpful. 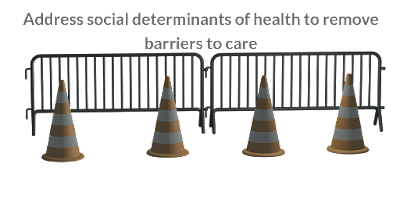 It's, it's sort of, and Brenda Schmidt from Solera mentioned, another way to think of social determinants of health is removing barriers to care. I think she said that. 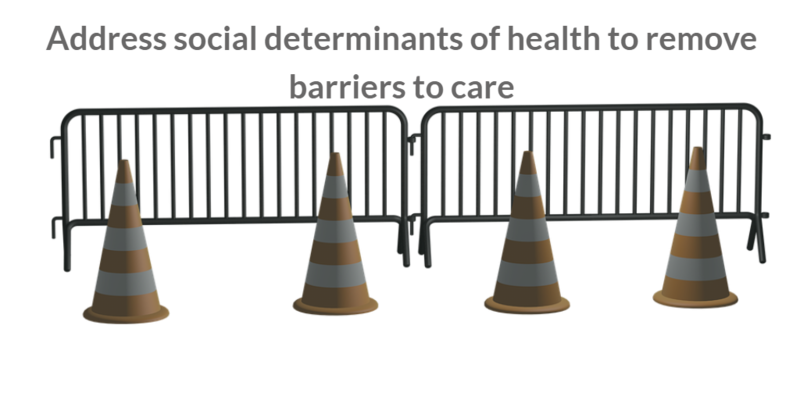 So, if you think about barriers to care, what are they? It's things like you don't have transportation, so even if I have a doctor's appointment or you need to go to the hospital, you can't get there. That's a problem. It’s lack of medically tailored nutrition so you don't have the meals to treat your diabetes or heart failure the right way. So, the food you eat can actually make you sick. She talked about statistics; like at the end of the month, something like admission rates can go up as much as 27% in certain communities because people have to choose between having their medicines, food or shelter. If that's the case people are going to make the choices that put food and shelter ahead of medicine, and so they're going to end up going back to the hospital. There's clearly momentum and recognition throughout the payer community as well as government and I think, increasingly, even among patients and people themselves, that we need this kind of help to stay healthy. And so, we're seeing changes now where health plans, not just Medicaid plans, where this has traditionally been covered, for even Medicare plans or commercial plans beginning to identify those patients, perhaps using artificial intelligence that could benefit from tools and services to overcome barriers to care that actually really have a major impact on them and deliver return on investment. So, CMS, the agency that runs Medicare & Medicaid in their so-called Chronic Care Act, recently decided that they'll start reimbursing for non-medical services such, as you know, nutrition and transportation. And also care coordination and in-home modifications that are not typically the domain of the clinician or the service for the doctor. The Chronic Care Act: A Game-Changing Move! So, can you explain how these supplemental benefits might work and again, to be clear, we're talking about Medicare Advantage population. I suspect that we're going to see this expand to traditional Medicare and then into the commercial world - as things typically happen in the healthcare world. Exactly. So, basically, Congress passed a law, the Chronic Care Act that you mentioned. It said for the first time ever that health plans can offer non-medical benefits; in this case for Medicare Advantage plans. So, it's not for typical Medicare fee-for-service. The idea is that, I think, does let the health plans make mistakes and then the government can learn from them to figure out how to change the larger Medicare program. Surprise! Non-Medical Services Actually Help People! In the past, and this is over 50 years, Medicare has always required that any health-related expenditure had to improve the person's health. So, the second piece is uniform benefits where every person had to get the same benefits everywhere. This new law changes that. 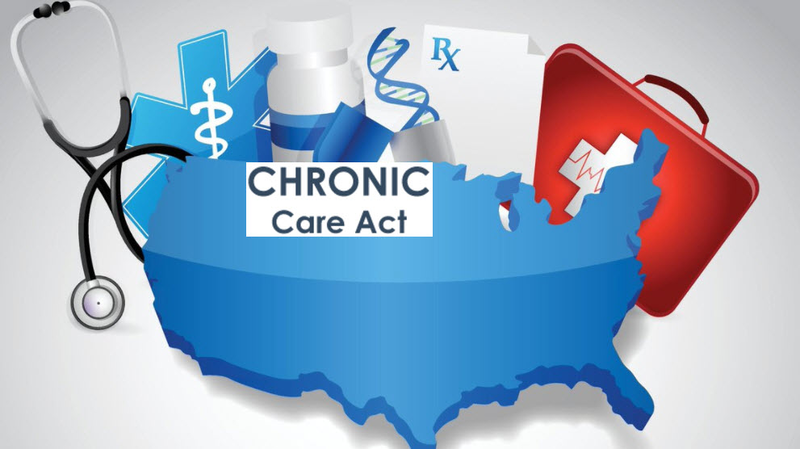 Now the new law [Chronic Care Act] doesn't go effect realistically until - until 2020, but next year health plans can begin to make these changes. Because CMS put out regulations in a letter in March that said [Medicare Advantage] health plans for 2019 can do this because they've reinterpreted what the statute meant. Now that only gave the plans six or eight weeks between when that was announced, maybe 12 weeks, and when they had to put in their plans for 2019. There are challenges for health plans, there will be adverse selection, right? People who are sicker might choose plans with extra benefits, and yes, that transportation benefit might help them, but will it help them enough to overcome the increasing level of burden of that health plan's population? These are questions that we're going to have to see how they play out over time. 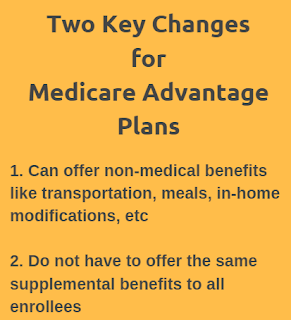 So, I think the idea that CMS is allowing some custom benefits for subgroups within a plan, and you're exactly right, I think they're using Medicare Advantage as a pilot. So, what you bring up in terms of its [MA’s non-medical supplemental benefits] are probably not going to be a big deal in 2019. 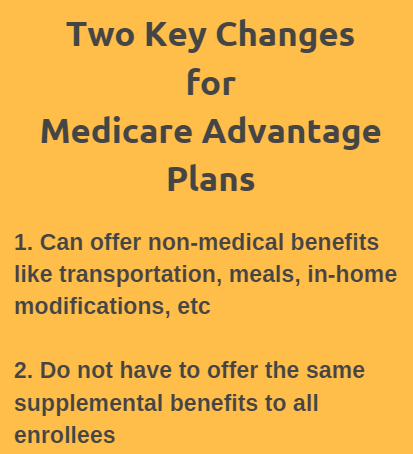 But we'll be using the early months of 2019 and we'll expect to see the 2020 Medicare Advantage bids increasingly include these non-medical supplemental benefits. Yeah, I think that's exactly right, and in terms of which benefits are going to be covered, because as you mentioned, there's a whole array of them. I think we'll see nutrition and we'll see transportation. I don't think we're going to see much in terms of the chronic home health aides, which is what a lot of people in the home health industry are hoping for. I don't think we're going to see much in terms of respite care or palliative care services. We might see home modification because there's evidence and literature that supports that. But I think health plans by nature are cautious, and so we're going to see a slow incremental change in 2019. And 2020, I think, is we're going to see much more expansion. I would argue that means for some health plans, they should be using now, the time in 2019, to set up pilot programs and figure out how are they going to operate this. How are they going to work out the bugs? Because they're going to have to contract with organizations that they've never contracted with before: Transportation companies, nutrition providers. They're going to have to figure out for non-credential, non-healthcare providers, how do they make sure that they're delivering what they say they're going to deliver? The fear of fraud, waste, and abuse which we've seen in the Medicaid programs, especially from home health providers, I think is giving insurance companies a lot of pause, which is legitimate. Right. 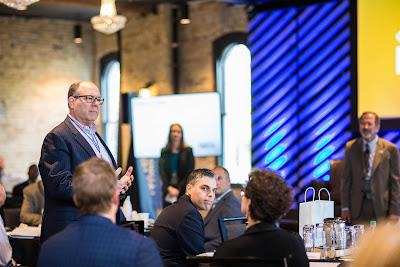 You know, this is really interesting and I think the last couple of days here at the HealthCare Executive Group that we've touched on a lot of these different topics that we're talking here with Dr. Michael Cantor. And let's close it out with a personal question. 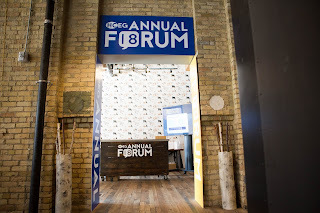 What did you like most about Minneapolis and the Healthcare Executive Group’s annual forum over the last couple days? So, the forum, I enjoy meeting a lot of really nice new people who are very very good at what they do. In terms of being great healthcare thinkers, providers, payers, and some really entrepreneurial people who are thinking outside the box and trying to make the changes that we need to have a better healthcare system. From a personal perspective, my brother Bruce lives here in Minneapolis, and so I got to see him last night, and I enjoyed seeing him and his family. And he and I got to go watch the Yankees lose to the Twins, which is a real privilege for Red Sox fan like me. So, it was excellent. Yeah, there was a lot of sports talk intermittently over the last 36 hours. So, we're wrapping up here today. We're at the Healthcare Executive Group's 30th annual forum. And if you're looking for more information on what we've talked about today, you can check out CareCentrix.com. That’s CareCentrix with an X at the end. And you can also check out the HealthCare Executive Group at HCEG.org. And you can look at the conference proceedings including all of the presentations and other material. I think we've got some videos and other stuff out there. So, thanks for tuning in, and we appreciate it. Thanks Steve. All right, take care! As I noted up front, I've been focusing on SDOH for years. Consider connecting with me on LinkedIn and maybe following me on Twitter.